Egyptian clothing from ancient times was quite light and made of flax plant fibres. This was mainly due to the Egyptian weather which was hot and dry and resulted in people preferring light clothing. The Most important component of Egyptian clothing was linen which was abundantly available. During the late Egyptian era when it became a province of Rome, cotton also began to be used which was mainly imported from India. Additionally, a small amount of silk was also used in the clothing of wealthy people. Throughout the history of Egypt, plant fibres remained the most important element of clothing. Among these fibres, linen was predominant. In the 1st century BC, Egypt became a province of Rome and cotton also became a component of Egyptian clothing. Since cotton was not produced in Egypt, it was imported from India. Egyptian trade with Mediterranean introduced the country with silk and during the second millennium BC, silk also became a component of their clothing. However whilst different materials were used in ancient Egyptian clothing, plant fibres remained the most important material. Ancient Egypt had a dry and hot weather and thus the traditional Egyptian clothing consisted of light clothes with light colours. These clothes were locally weaved and sewed while spinning was also done locally. Traditional clothing was mostly left in the natural colours but for additional styles, sometimes plant dye was used. Traditionally, animal fibres were also used in the clothing of the wealthy people. The most common traditional ancient Egyptian clothing for the peasants and common people was a kilt-like piece of fabric worn around the waist. It was known as a shenti. The clothing of the ancient Egyptians is on display here, showing the varying styles on common items. There was considerable difference between ancient Egyptian clothing for Pharaohs and that of common people. This was to signify the higher status of the Pharaohs. One of the most essential components of ancient Egyptian clothing for the Pharaohs was called Nemes which was a royal headdress. Kings began to use it during the Third Dynasty and it was given the status of royal headdress during the Fourth Dynasty. Another important component of ancient Egyptian clothing for the Pharaohs was called Shendyt which was a royal apron or kilt. Common people also used Shendyt but the one used for Pharaohs was entirely covered with accordion pleating. For men clothing consisted of simple garments during the Old Kingdom. The most important element of this clothing was the wrap-around skirt called Shendyt which was tied with a belt around the waist. These skirts were short during the Old Kingdom but became longer during the Middle Kingdom around 1600 BC. Around 1420 BC, further changes in clothing for men occurred and a light tunic or blouse with sleeves began to be used. There was little change in the ancient Egyptian clothing for women during the Old, Middle, and the New Kingdoms and was relatively more conservative than mens clothing. Women’s clothing consisted of simple sheath dresses which were known as a Kalasiris. These dresses went down to the ankles and were held up by straps around the shoulders. The upper edge of the dress could be worn above or below the breasts. Embellishments on the dress could be used to signify the social status of the owner. Various shawls or robes could also be worn over the dress. Most of the slaves in ancient Egypt worked naked. However, some slaves used simple clothing articles usually made of animal skin or linen. The male slaves who did wear the clothes mostly used a short linen kilt while the ancient Egyptian clothing for female slaves mainly consisted of skirts which extended from the shoulders to the ankles. Slaves whose owners were wealthy individuals wore better clothes than the slaves of the common people. 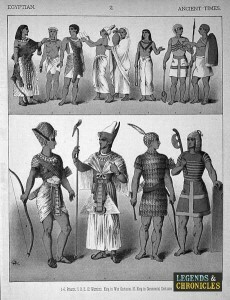 More Egyptian clothing including outfits worn by Egyptian soldiers and guardsmen. Ancient Egyptian clothing for children was very simple and consisted of simple pieces of cloth. Usually children did not wear any clothes because of the hot and dry weather. During the winter months, however, ancient Egyptian clothing for children consisted of wraps and cloaks which could be stitched or just wrapped around the body. Children of the lower classes usually went about naked up till the age of six after which they started wearing the same clothes that their parents did. Various fashions were used in ancient Egypt in addition to ancient Egyptian clothing. For instance, both men and women of upper classes made use of wigs made of human and horse hair. These wigs were usually also ornamented and could be woven into certain hairstyles. Jewelry was common in upper as well as lower classes and was made from various metals including gold, silver, and beads. Use of such jewels as bracelets, rings, earrings etc. was common among men and women. Cosmetics and perfumes were also essential in ancient Egyptian fashion and painting nails and hands with henna was popular. Ancient Egyptians made use of various kinds of masks for funerals and other purposes. The funerary masks were used to cover the faces of mummies. Masks for Pharaohs were sometimes made of solid gold but this was rare. It was also common in ancient Egypt for the priests and priestesses to wear masks during religious ceremonies in order to bear resemblance with certain gods. Religious rituals also made use of animal masks which again was to bear resemblance with gods. But while masks were common for funerary and religious purposes, they were not an integral part of ancient Egyptian clothing. Different types of ancient Egyptian clothing were used for men, women, and children, with each having their own visual identity. Furthermore, the clothing reserved for the Pharaohs was different than that of the common people and was used to signify the status of the kings. Upper classes like the pharaohs made rich use of jewels and wigs while slaves and children usually went about naked. There was some difference in ancient Egyptian clothing for men during different periods of history in the Egyptian kingdoms but it remained more or less the same for the women.